Images should not be reused without permission. Details: The staff car park at Uxbridge Station has four spaces marked out for LBSL Infrastructure vehicles, but it is rare (though not unheard of) to find that many present. 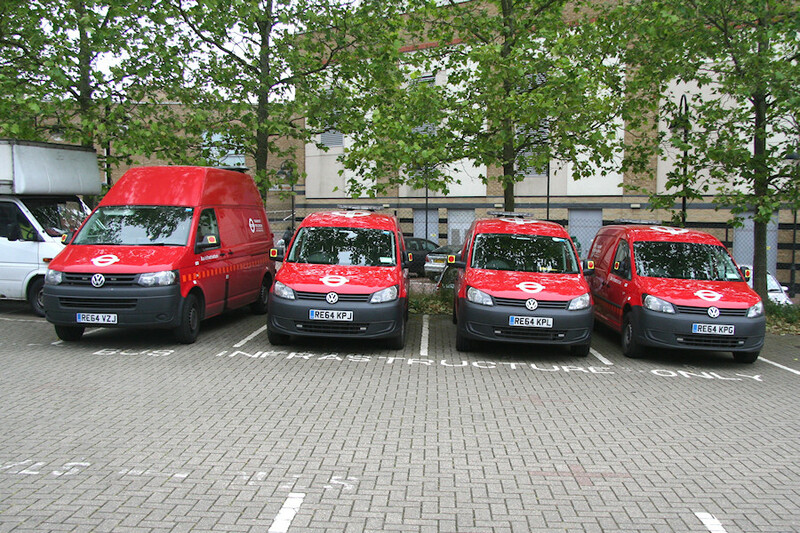 Derek was lucky on 13th June 2015 to find (from left to right) VW Transporter van 7836VW along with VW Caddy Maxi vans 7899VW, 7898VW and 7900VW. 7900VW appears to be the main Uxbridge vehicle. 7836VW and 7899VW divide their time between here and Acton, while 7898VW seems to be a floating spare, having also been reported at Finsbury Park and Morden.